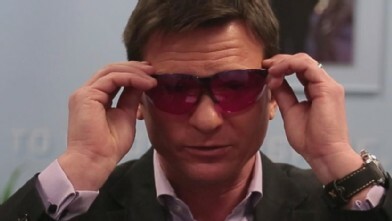 EnChroma claims their glasses, at $450 a pair, help color-blind people "perceive color better." Imagine living your whole life in muted colors, or maybe you don't have to imagine because color blindness is surprising common. Well you are about to meet a man who accidentally stumbled as the best inventers often do upon what he basically says is a miraculous fix. Tonight we are trying it out for our series first. Here is ABC's aditi Roy. Oh, my god. Oh, my god. Reporter: What if you opened your eyes -- Oi have never seen this many colors all my life. Reporter: And the world looked different. Viral videos of people said to be color blind. The sky is supposed to be this color? Reporter: Experiencing for the first time what they say is a world popping with new colors. Look at your kids' eyes. They're so pretty. Reporter: But are the reactions to these new glasses developed by a company called inchroma real or clever? Borrowing a pair from the company and embarking on our own nonscientific study of three color blind people. This is my room. Reporter: Meet Maddux, a fifth grader about to paint his bedroom. This I know is blue. They tell me. It looks purple. I think it has Oranges in it. Reporter: Danielle an artist working with colors she cannot fully see. These don't have any labels on them. Having to figure out what color it is. Reporter: And Oscar. Who dreamed of being a fighter pilot until he discovered his condition prevented it. What color flowers do you see here? I see reddish-pink ones over there. And these are yellow. These are bright yellow. Yeah. This is orange-yellow. Reporter: All that could change by the end of the day when each of them will try on a pair of these glasses. We are selling these very quickly. Soon as we order 500 or 1,000 pairs are sold. Reporter: Don Macpherson, the chief scientist, he said initially he developed glasses as protective eyewear for surgeons. Made blocking wave lengths of light. Reporter: Then one day. I was playing in an ultimate Frisbee game. My friend was color blind. He borrowed my glasses and said I can see the cones on the field. The lightbulb went off. Reporter: This is how it works. Lenses contain a vertical filter that blocks out certain wave lengths helping the brain make distinctions between colors. For a company using a tag line, color for the color blind. There is another distinction Macpherson would look to make. Do you cure color blindness? Absolutely not. No. We help people perceive colors better with the eyewear. Certainly they can't give color to a color blind individual. Reporter: Dr. Mark Frommer an eye surgeon from Lennox hill hospital in New York doesn't believe the glasses can change the color blind eye's ability to see true colors. Reporter: They're not getting the rainbow. They're getting an aid. An optical device. Reporter: Macpherson disagrees. What are the promises you are making for people with color blindness? Improved quality of life. The world is wonderfully colored. To not fully experience that is a shame. Reporter: Will they receive any of the benefits? First we had all three tested for color blindness. So Maddux this is a screening test we use in the office to test for partial or complete color deficiency. Try to do your best to see the number made up by the color dots. I don't see anything. Nothing. I dent don't see any number. Tell me what you see? I Deon't see anything there. This one? No. Might see a 6 there. Nothing there. Nothing. Reporter: All three definitely color blind. The glasses cost up to $450. Come with a money back guarantee, and have competitors like o-2-m and color correction system. The one test that matters most to our participants will the glasses enhance their color vision? We took Maddux and both of his moms to the botanical gardens in San Francisco's golden gate park. Okay, what happened? Turn around. Does it look any different? Kind of. Kind of. Not really. Oh, well. Keep them on a little bit longer. Little disappointment, huh? Yeah. Oh, well. Across town, Danielle takes her turn. Wow. It's kind of intense to be able to see colors for the first time really. I don't know if it is the way they're meant to be seen. I'm pretty emotional about it. Reporter: Across the country Oscar tries them on with his fiancee. This is amazing. Oh, my gosh. Reporter: But his biggest reaction this traffic light. I can see that. Reporter: Until now Oscar only knew the light was red because it was the one on top. Sorry. I'm getting a little emotional about a streetlight. Two out of three of our candidates had strong visceral reactions. But inchroma predicted the outcome with their own online test. We wondered what would happen if Danielle retook the color blindness test we gave her earlier wearing the glasses. We asked the guy what he thought would happen. Will people be able to recognize the Numbers? Y. Yeah. Whereas they weren't before? Yes. But it doesn't really prove anything. Reporter: Despite her amazed reaction to the glasses. It's kind of intense actually. Reporter: Danielle's results on what many ophthalmologists call the gold standard color blindness test. Sorry. Unchanged. We did an unscientific study, they took the test before the glasses and afterward. And they didn't show any change. How do you explain that? The test is not a valid test for measuring color deficiency. We have never used it. For the simple reason that the test is not designed to be used with a filter. Reporter: Macpherson claims there is a better test one he says they used in their clinical trials. We decided to have the test. The Farnsworth exam, with and without the glasses. To Oscar the would-be pilot. Roll those 15 disks in the proper order in a gradual sequence increasing hue. Roipt resu Reporter: The results without the glasses? 6 of 15. About half. Reporter: With the glasses. We moved the expeerment to take full advantage of the sunglass style lenses. You had 8 you misidentified out of 15. Rip he actually appears to have done worse wearing the sunglasses. It's not a great performance. Let's think of it this way, if I have a black and white TV and I put on special glassize am not going to see color TV. I am almost scared to touch them. Like the pink will run away. Reporter: Daniel and Oscar say they couldn't care Lisa but the test results. They say seeing is believing. Wow. Reporter: And since that first day he tried them with us. Here and here. Reporter: Oscar's bought one pair. And says he is buying another. For "Nightline," aditi Roy, in San Francisco. 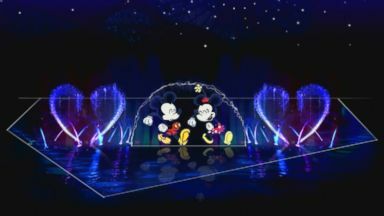 Hear from the imagineers and animators who created scenes for the Disneyland spectacular.